The club is situated on the A6 in the village of Quorn next door to the Quorndon Fox public house. The club house, visible from the road looks like a thatched cottage. There is free off road parking in the club’s grounds and a licensed bar. If you are new to bowls and would like to ‘have a go’ come along to a Friday evening ‘roll up’ (contact details below). There is a small fee to pay and you can borrow a set of woods. To play on the green you need to wear flat smooth rubber soled shoes without heels. Once you get the hang of the game you may want to buy your own set of woods and proper shoes. Members will show you the how to play and you can be bowling within a few minutes; it’s not a difficult game to learn. Or, if you want to have a look first, come along on a Friday evening in the season to watch. We play bowls from April through to October and there are opportunities to play for the club in a number of different weekday and weekend matches against other clubs, as well as the chance to take part in club competitions. Friday night is ‘roll up’ night, a relaxed evening of bowls when new and experienced players enjoying a pleasant game followed by a snack and a drink in the clubhouse. Membership is open to all, whether you are an experienced bowler or a complete beginner and you can join at any time of the year. Details of membership, our open day and fees are available from the club secretary (see below). As a member you can enjoy the club’s playing facilities and social events. The club’s facilities are used throughout the year; when the bowling season ends there’s a fun quiz in the clubhouse on alternate Friday evenings and details of other events are published on the club house notice board. The Quorn Mills Park Bowls Club was founded by M. Wright and Son for employees of the mill and opened for the first time on the 10th June 1920. That was over 85 years ago and today it is now a thriving private bowls club. 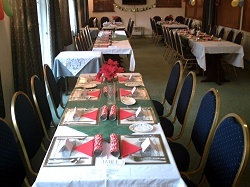 The Club Room and associated facilities are available for hire for private functions. Contact the Club Secretary for details. For more information on the club, how to join, or details of when you can come along and have a try, please visit our main website - www.quornbowling.co.uk.